I am one of those crazy people that could just eat marzipan. 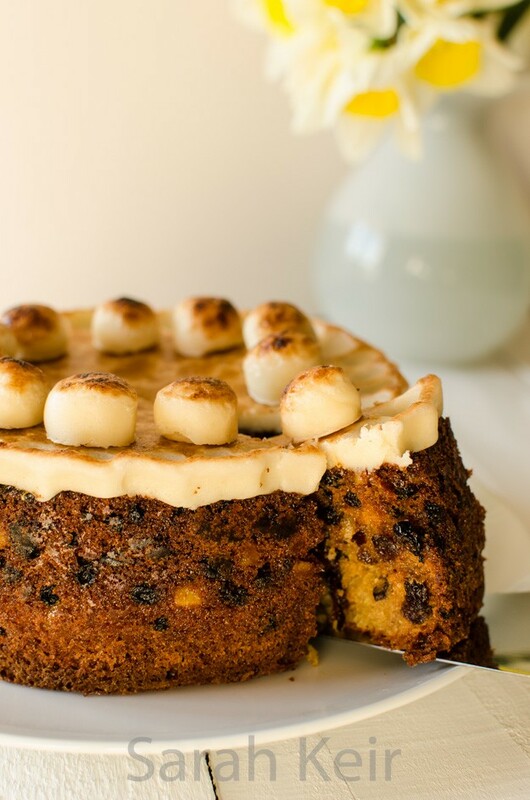 Forget the icing and sometimes even the cake, I go for the marzipan. If you are one of these people too then keep reading; if not then skip this recipe! 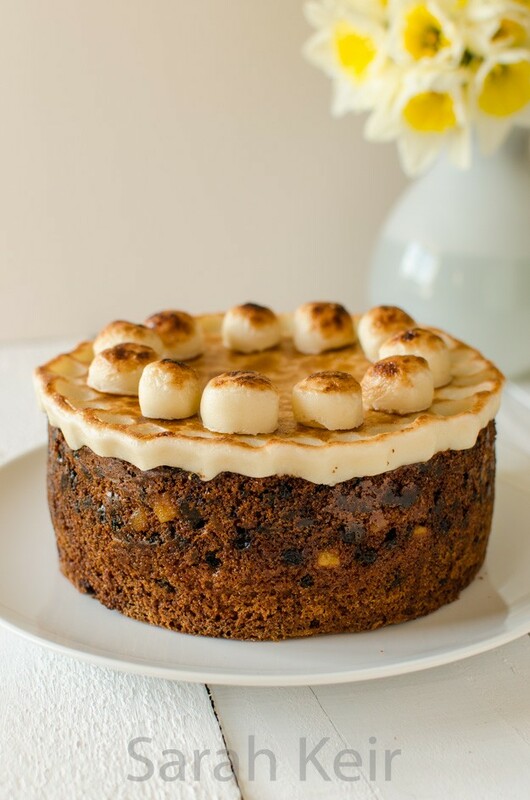 Simnel cakes are considered an Easter treat these days, but in the past they were part of a Mothering Sunday tradition of girls in service taking a cake to their mothers on the one day off work. The eleven balls on top, to represent the apostles minus Judas, are a Victorian puritanical addition. By the way, has anyone out there baked a scripture cake, where the recipe is hidden in bible verses? Maybe a project for the future? 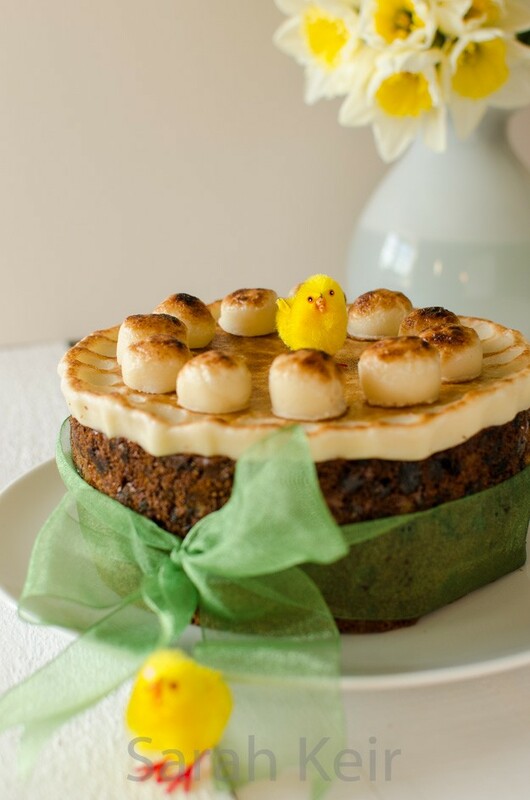 I like to decorate my simnel cake with ribbons and those kitsch plastic chicks in the shops at this time of year. It is amazing how just the past couple of weeks, the weather and feeling in the air has turned spring-like. Even between the squally showers, the daffodils nod their ridiculously over the top yellow-cream heads, birds are shouting ‘come and get me’ from every branch and already the lawn needs mown. Happy Easter everyone! Preheat the oven to 140 C/120 C fan. Prepare a 18cm/7 inch tin like for the Christmas cake recipe here (grease, line and wrap the outside in newspaper). Cream the butter and sugar until pale and fluffy. Sift over the flour, salt, baking powder and mixed spice and add the beaten eggs. Beat until well mixed. Add some milk if it is very stiff but you need a fairly stiff batter to support the dried fruit. With a metal spoon, fold in dried fruit, candied peel and lemon zest. Put half the mixture into the prepared pan and level the top. Take one third of the marzipan and roll out to be a circle of diameter that will fit inside the tin. Use the bottom of the tin to measure and trim to fit; place on the cake mixture. Add the rest of the cake mixture and smooth the top then leave a slight dip in the centre. Place in the middle of the preheated oven for 2 to 2 and half hours until a skewer comes out mostly clean (the melted marzipan will mean it will never be truely dry until completely over cooked). If the top is browning too fast, make a baking parchment or foil hat with a small hole in the centre for steam to escape. Allow to cool fully in the tin before turning out. Brush the top of the cooled cake with apricot jam. Roll out another third of the marzipan and cover the top of the cake, scalloping the edges by pinching the almond paste. Toast this under a preheated grill until medium brown; watch constantly as it burns easily. Roll the remaining marzipan into 12 equal balls and eat one (it much easier to divide into 12 than 11 and the extra ball is a cooks perk! ), toast under the preheated grill on foil and when cooled add to the top of the cake, gluing the balls in place with apricot jam if necessary.